James William Johnson (JJ) was born at 6:23 PM on Pi Day (3.14.19) to Alisa Morse-Johnson and Bill Johnson. JJ arrived at a whopping 9lbs 8.8oz and 20” long after Mommy spent almost 4 days in labor! Mom, Dad and JJ are exhausted but healthy and happy! Congratulations to the Johnsons! Alex White passed away from lung cancer last Wednesday. Althea is still working out a date and time for a memorial service at the church (maybe March 30 or 31st). Following the memorial service, there will be an inurnment service at one of the Leavenworth National Cemeteries with military honors. Please remember Althea and the family in your prayers. 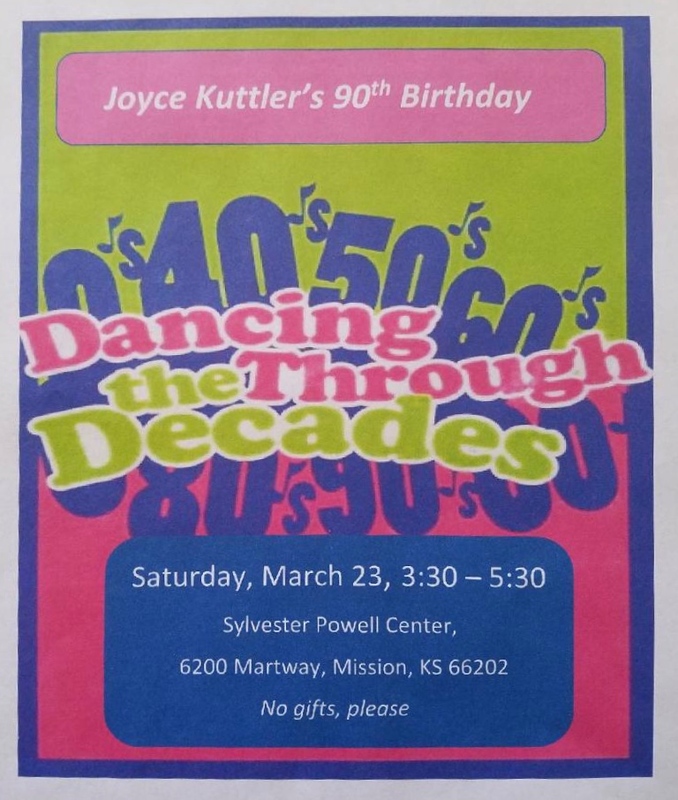 Come and join us for Dancing Through the Decades, a celebration of Joyce Kuttler’s 90th Birthday. The celebration will be at the Sylvester Powell Community Center (6200 Martway, Mission, KS) from 3:30-5:30 PM on Saturday, March 23, 2019. No presents please, just your presence! Please RSVP to Debbie Rushfelt 913 226 3617, or Dorothy May 913 341 9031 by Sunday March 17, 2019. The Adult Class will continue to the study of "The Story of Christianity: The Early Church to the Dawn of the Reformation, Volume 1" by Justo Gonzalez each Sunday. Next week’s class will continue to discuss Chapter 32 (“The Golden Age of Medieval Christianity”) beginning about page 372 (the reintroduction of the teachings of Aristotle). Jane Landrum and Jonathan Bacon will lead the class discussion. The Adult Sunday School class has voted to follow the study of “The Story of Christianity: Volume 1” with the study of “The Story of the Christianity: Volume 2, The Reformation to the Present Day” by Justo L. Gonzales. We’re in the process of acquiring books. The paperback edition costs $25 but we’re also looking to lower the price by buying like-new used copies. If you’re interested in a copy, please contact Jonathan Bacon. A business meeting will be held on Sunday, April 28, 2019, during the Sunday School hour (starting at 9:15) to consider the approval of several priesthood calls. The date of our next TWIST weekend is just around the corner. (PLEASE NOTE THE DATE HAS BEEN CHANGED!) We hope to see you there! Please RSVP by April 26th. We will need the Event Registration Form found at https://bit.ly/2TgNSu6 filled out by May 3rd. Please remember your TWIST t-shirt if you have one. If not, we have plenty. We will be showering at the YMCA on Saturday evening, so pack accordingly. Suggested donation: $20. The Center of Hope Food Pantry can use non-perishable food year-round. The need never ends. Remember, “And the King will answer and say to them, ‘Assuredly, I say to you, inasmuch as you did it to one of the least of these My brethren, you did it to Me.’” Next time you’re shopping, why not get an extra box of breakfast cereal, rolls of toilet paper, school supplies, a canned good or two or whatever the spirit leads you to offer. The All Good Books group will meet this Thursday, March 21, 2019 at 7 PM in the Church Library to discuss "Eunice: The Kennedy Who Changed the World" by Eileen McNamara. Discussion questions for the biography will be posted on the book club website at http://allbooksclub.wordpress.com soon. The schedule of upcoming books for discussion is always available at https://allbooksclub.wordpress.com/meeting-dates-books/. In the future, if inclement weather forces the cancellation of church services at Mission Road, we’ll post the closing on our church Facebook page, send a message to the church email list and list the closing on KCTV Channel 5 and KSHB Channel 41. Be sure to check the TV listings for either "Community of Christ – Mission Road" (KSHB 41) or "Community of Christ – Prairie Village" (KCTV5). The listing will be under one of those two names. DO YOU KNOW SOMEONE WITHOUT EMAIL OR FACEBOOK ACCESS? If you know someone in the congregation that does not have email and does not use Facebook, please let Jonathan Bacon know. We’re trying to be sure everyone in the congregation has access to periodic news updates and information on congregational activities. Monday, March 18, 2019, 7:00-8:30 PM – Mission Bells rehearsal. Wednesday, March 20, 2019, 6:30-7:30 PM – Saints’ Choral Rehearsal in Church Sanctuary. Wednesday, March 20, 2019, 7:30 PM – Prayer Circle in Church Library. Thursday, March 21, 2019, 7:00 PM – The All Good Books group will meet to discuss "Eunice: The Kennedy Who Changed the World" by Eileen McNamara in the Church Library. Sunday, March 24, 2019, 8:45 AM – Breakfast (provided by Marge Trinkl), join us for conversation and fellowship. · Nursery available – 9:15-11:30 AM, in downstairs Nursery. · Children’s Sunday School class – 9:15-10:15 AM, taught by Mary Reichenbach. · Teen’s Sunday School class – 9:15-10:15 AM, taught by Clint Reine. · Adult Sunday School class – 9:15-10:15 AM, discusses "The Story of Christianity: The Early Church to the Dawn of the Reformation, Volume 1" by Justo Gonzalez, taught by Jonathan Bacon, Paul Bennetts, Jane Landrum and Dennis Wood in the Church Library. Sunday, March 24, 2019, 10:30 AM – John O’Neal will speak on the theme "Repent" with Debbie Rushfelt serving as worship planner and Mary Reichenbach serving as presider. The Mission Bells will provide the ministry of music and Steve Hedrick will provide the PowerPoint. Audio recordings of past worship services are available online at https://bit.ly/2MSgZW8. This is a short URL for a Google Drive folder with past recordings. Recordings are located in folders corresponding to the year (e.g., 2017, 2018). If you missed a Sunday, this provides you a way to hear the music and the message. Each audio recording begins with the date of the service (20190224 represents February 24, 2019). The date is followed by a dash and the first initial and last name of the speaker. NOTE: If you experience problems playing these audio files be sure you’re running the latest version of your browser or try a different browser. In some cases, you may be required to download the audio file before playing it. 17 March 2019 message by Steve Holben coming soon. Please know that any member of the congregation can post prayer requests or share information about members and events on the Mission Road Members Only Facebook page. You do not need to send the information for approval to anyone. In fact, doing so may slow down the dissemination of your request. Be sure to include the person needing prayers and what situation has occurred (if you wish to share that information). If your post concerns an event or news item, be sure to include the basics in your posting (such as who, what, where and when). For prayer requests, if you do not have access to Facebook, then please call Paul Bennetts our Congregational Pastoral Care Coordinator. Visit and "like" each of these sites to keep up-to-date on congregational news. If you have news items and calendar additions or changes that need to be included in the congregational news email, please contact Larry Birkby. His email address and phone number are both in the Church Directory.